THE NUMBER OF families living homeless in Dublin has increased by 100% over the last year according to figures from the Dublin Region Homeless Executive. The issue of homelessness is one that isn’t going away, with the news that at least five families have been sleeping rough in the capital during July. Yesterday, it emerged that a Romanian family with three children under the age of five had been forced to sleep in a Dublin park after being evicted by their landlord (the executive has confirmed to TheJournal.ie that temporary accommodation is now being provided for the family in question). Separately, the former lord mayor of Dublin and chair of Inner City Helping Homeless (ICHH) Christy Burke described to TheJournal.ie the case of Lorraine Wolfe and her 15-year-old son Carlos who had been sleeping in the A&E department of the Mater Hospital in recent times. Burke has said that he believes the Dáil should be recalled from its recess to deal with the issue. “If this isn’t a crisis then I don’t know what is,” he told TheJournal.ie yesterday. The number of families currently registered as requiring emergency accommodation per the homeless executive is 531, totalling 729 adults and 1,122 dependent children. Currently, the average nightly placements by Dublin’s local authorities into emergency accommodation total 228. 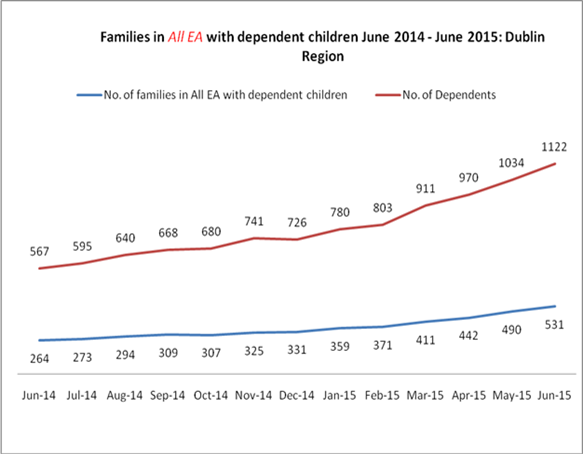 Crucially however, the number of families registered as being in such accommodation has increased from 264 in June 2014 to 531 just 12 months later. Similarly, the number of dependents living in emergency accommodation has exploded from 567 in June 2014 to 1,122 as of June 2015 in what an executive spokesperson has described as an “unprecedented demand” for their services. “We continue to expand and implement measures to respond to the housing needs of homeless households,” said the spokesperson. However the significant challenge remains that the level of families presenting to homeless services is not keeping a pace with the number of families that are moving out of homeless services and back into independent living. Various homeless outreach groups have called for urgent government action in the face of the crisis. “We believe if the Government is serious they would go out and purchase 1,000 apartments, they would then end the misery of hotels and B&Bs,” Christy Burke told RTE’s Liveline yesterday afternoon. There is also an €18 million shortfall from the Department of the Environment to homeless services, and the elephant in the room is the landlords who are continuously evicting families without any rights, and nobody is addressing the landlord issue. I think the time has come to open up army barracks’ and convents because we can no longer tolerate women and children and men on the streets. Meanwhile, director of advocacy with homeless group Focus Ireland Mike Allen said that the crisis is now “getting out of control”. “Let us be crystal clear here – we are talking about fathers and mothers being left sleeping in cars with their children or even on a bench on the street,” he said. We do all we can to prevent this but I am sure anyone would agree this situation is not only untenable it is also totally unacceptable. Email “These two figures show why people are so worried about the Dublin crisis”. Feedback on “These two figures show why people are so worried about the Dublin crisis”.